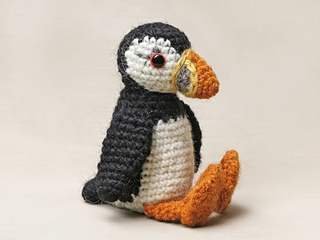 This is a .pdf crochet pattern, written in standard American crochet terms for Plubby the puffin. 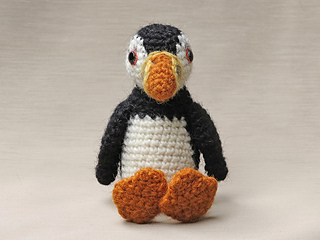 With this easy pattern you can make this very special whimsical looking bird. 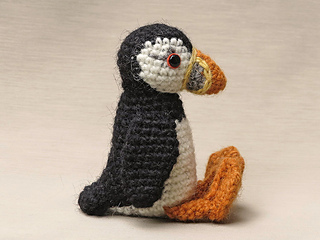 Size of finished puffin made with worsted weight yarn: 5.1 inch / 13 cm when sitting. An intro with useful info. List of materials, tools and accessories needed. Brand and colour numbers of the needed yarn. 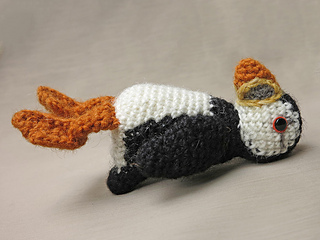 A clear and colour coded description of how to crochet and assemble the animal. Pictures and illustrations to help getting everything right. 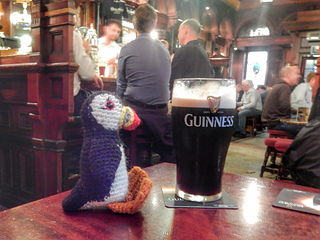 All my patterns are text edited for correct English and have been tested by an experienced crocheter before publishing. 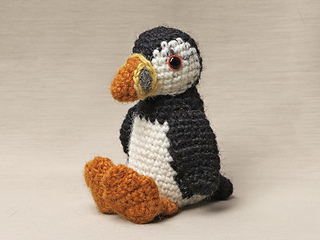 For this crochet puffin you’ll need worsted weight yarn and an E US/3.5 mm crochet hook. You’ll need five colours of yarn, black (1/5 of a 100 yard skein), white (1/5), orange (1/10) and a little bit of grey and yellow. For the eyes I’ve used 8 mm animal eyes. Behind the eyes I’ve placed a small orange felt patch. You will also need fibrefill and pellets for a bit of extra weight in the body (I use Hama beads). Lopi colour numbers: 0059, 0051, 1410 (1704), 0057 and 1411 (1703). Istex Lett lopi. I strongly recommend using a fuzzy yarn because it gives the best result. Gauge is unimportant for this pattern. If the pieces are crocheted tightly enough, they will not gape visibly when stuffed. You can make a little test swap to be sure. 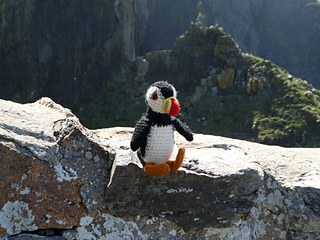 For fun, support, suggestions, crochet alongs, showing off and much more, please come and join us in the Son’s Popkes crochet animal group.